This article will demonstrate how to use a metered-dose inhaler by using either the open or closed-mouth technique. 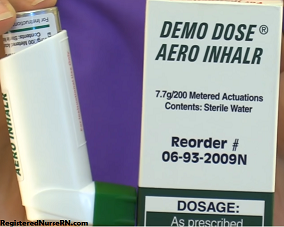 What is a metered-dose inhaler? It’s an inhaler used to administer a set amount of medication into the lungs. Medications that are used include bronchodilators, corticosteroids etc. When administering a MDI, it is important to teach the patient proper technique. This will help increase the amount of medication that enters the lungs rather than the mouth. It is best to use a spacer when using a metered-dose inhaler. This will ensure most of the medication enters the lungs rather than the mouth. Corticosteroids can be very irritating to the mouth and can cause thrush. If a spacer is not used, the open-mouth or closed-mouth technique can be used. Always teach the patient to use the method prescribed by the physician. 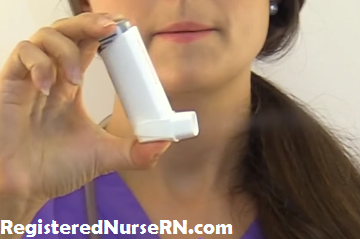 The method used by the patient depends on the patient’s ability to hold the inhaler and follow directions. For example, the open-mouth technique may be hard for younger or older patients to perform, and they should be taught to use a spacer or the closed-mouth technique. ***The key with both techniques is to breath in and spray the inhaler at the same time…if done at different times this will affect the amount of medication that will be administered into the lungs and may lead to most of the medication staying in the mouth. 5. Hold the inhaler in between the thumb and two fingers. 6. Shake the inhaler for 8-10 seconds. 7. Measure two fingers in between mouth and inhaler and aim the inhaler at the mouth. 9. AT THE SAME TIME…breathe IN slowly through the mouth and press down on the inhaler…keep breathing in until no longer able. 10. Hold breath for 10-12 seconds and then breathe out slowly. ***Always gargle and rinse mouth with water and SPIT after using a corticosteroid inhaler. *If more than 1 puff is ordered, repeat in one minute. 12. Perform hand hygiene and document. Look at the inhalers ordered: are you giving both a bronchodilator and corticosteroid? 6. Shake inhaler for 8-10 seconds. 7. Breathe in and breathe out all the way through the mouth (not nose) until can no longer. 8. Place mouthpiece in mouth in between teeth (keep tongue flat) and seal mouth around the inhaler.